Not everyone disliked Edmund Burke’s “Reflections on the Revolution in France” as much as Paine did. Yet even the positive reviews suggested Burke’s position as regards the revolution in France was inconsistent with his previous support for the American Colonists. As “The Critical Review” (Vol 60, p. 529) puts it, “revolutions, or the calamities of kings, have not formerly been odious to Mr Burke”. This argument is illustrated in the caricature above (from the Library of Congress). 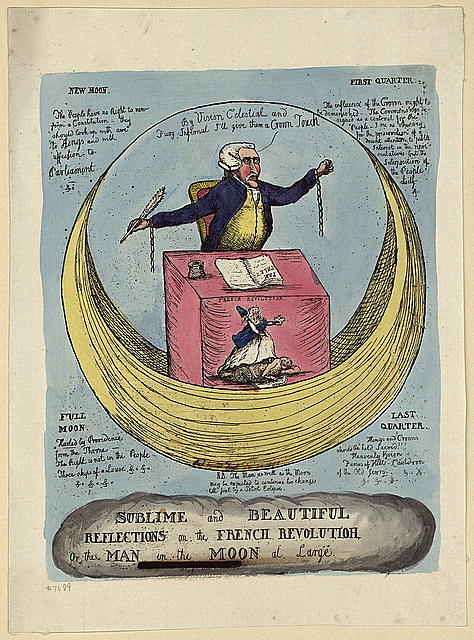 Edmund Burke is the Man in the Moon, writing a pamplet seated at a table placed on a crescent moon. The table is covered with a cloth, bearing the words “French Revolution” and a figure with a liberty cap in one hand and a crown in the other. The figure is trampling a man holding broken chains and torture implements. ‘NEW MOON. The People have no Right to new form a Constitution – they should look up with awe to Kings and with affection to Parliament &c.
FULL MOON Hurled by Providence from the Throne – The Right is not in the People – Three skips of a louse &c. &c. &c. &c. &c.
Beneath the crescent is etched: ‘N.B. The Man, as well as the Moon may be expected to continue his changes till fixt by a Total Eclipse’. Though it is true that Burke viewed the revolt by the American colonists and that of the French people very differently, it is also true that they were different types of event. As the quote from Christopher Hitchens yesterday pointed out, Burke alone was correct in foreseeing the Terror and war that overtook the Revolution in France.